PHYSICAL THERAPY (PT): WHAT’S AT STAKE IF I DON’T DO IT AFTER SURGERY? For a lot of people, those are dreaded words. They mean multiple appointments, copays, and time. However, physical therapy is one of the keys to a true recovery after a surgical spine procedure. Coming off of surgery you’re likely to be more weak than normal. What you may not realize is weak muscles are a detriment to spine and joint function. The faster your body gains strength, the more positive your body will respond as a whole. Post surgery you may have to contend with residual pain or other symptoms. Whether it’s massage, heat, ice, electrical stimulation, or simply education on posture and movement, your physical therapist can help you control those symptoms. As you do PT your nerves send signals to your brain to help your joints regain mobility. The increase in flexibility from PT releases tension from your muscles and body overall. Thus, you are less likely to overcompensate with incorrect posture that may lead to more issues. At the end of the day everyone wants a speedy recovery. 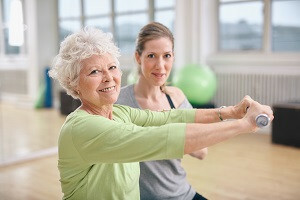 You have the best chance at feeling like yourself again and getting back to your daily activities by actively participating in physical therapy. Want to learn more? Click the link to find out about physical therapy after minimally invasive back surgery. Connect with one of our Patient Ambassadors and see how they might be able to help you prepare for a spine procedure.